04.16.2018: Happy Tax Day! I wish I had remembered that when I trekked out today to put this weekend’s packages in the mail. And we had such lovely arctic spring weather for the long walk to actually get near the silly place. That aside! I’m down to my last 14 orders that I’m packaging up tonight. Most of these are international because the packaging part is a little different to try and keep shipping costs down and of course the customs forms. But I’m moving right along with that. 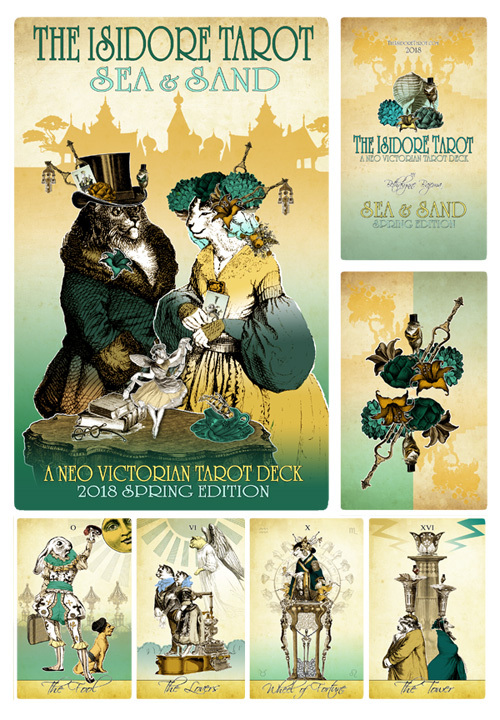 In related news, after tending the inbox for me and taking requests, Maggie has suggested we put the Sea and Sands decks up for a little longer. I agree. We have a special display for the decks at our first convention at the end of the month, so why not offer a few more leading up to that? Shipping times for these decks will be one to two weeks as we have them on hand. 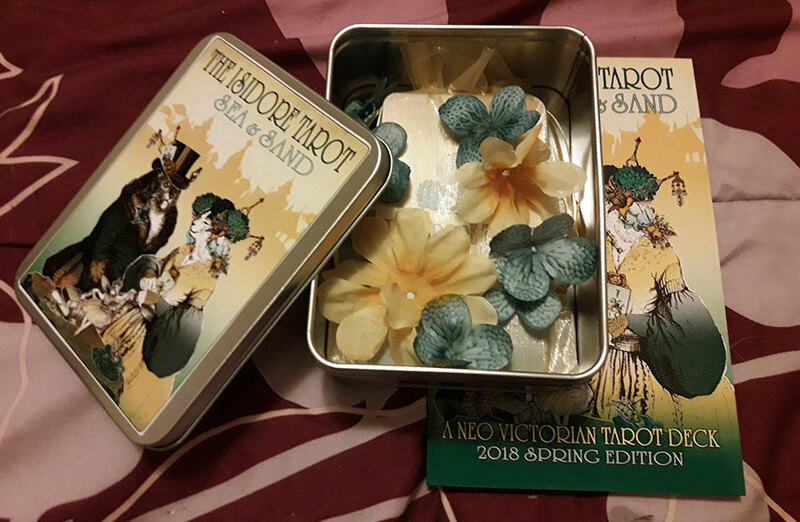 If you’re in the midwest and attending the Cincinnati Steampunk Symposium the last weekend of the month you can avoid postage costs and order one to pick up at the con. Just contact us to order and get pick-up details. The first third edition Isidore decks have arrived! Order packaging begins this weekend with first orders beginning to ship this coming Tuesday. The Sea and Sand decks will be arriving next week and those orders will begin shipping shortly after. Every thing looks lovely. All orders should be into the post by mid April. This was a particularly well received sale so filling orders will take up most of my time, I appreciate your patience. And remember – you’re always welcome to contact me for a rough estimate when your order will ship. I will continue to update the ghost blog with shipping progress. 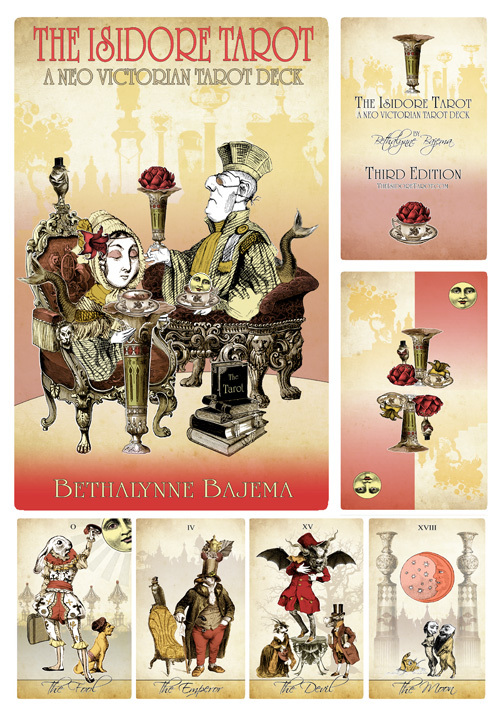 The Tea Bats Lenormand sale will conclude this Friday. I had it listed to end on the 24th of the month, but I’ve let it remain up a few days longer as I get through a little R&R downtime for check-ups and some follow up care. I’m almost a whole witch again! UPCOMING SALES: The Black Ibis Tarot, the brand spanking new third edition, will go on pre-sale April 1st, no fools! 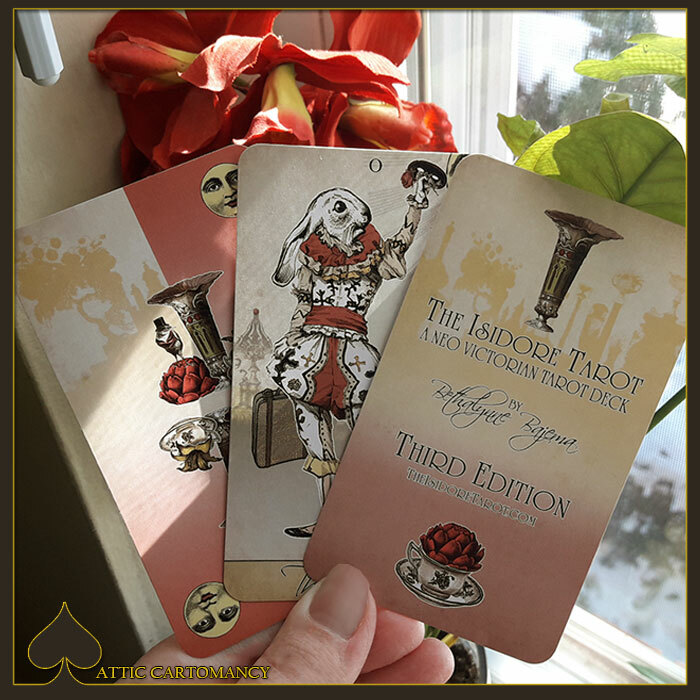 ;) The Sepia Stains tarot will become available for pre-sale (for the first time in more than a year actually) may 1st. Now, this shoppe witch needs to get back to work. Have a lovely week! The first sample Isidore deck arrived today; this one being for the Sea and Sand deck. It looks lovely. The colors are very vibrant. The photo below really doesn’t do it justice. Another quick note: I mentioned this in the mailing list email that just went out – the Attic Shoppe site is getting a spring cleaning over the next week. You might encounter the occasional page in mid-edit. This hiccup will be brief. Thank you for understanding; the site has needed this for awhile. Have a wonderful day!